So of course it's the perfect time to start planning for Christmas! Over the next two weeks, we'll be sharing all things winter holiday related with you. 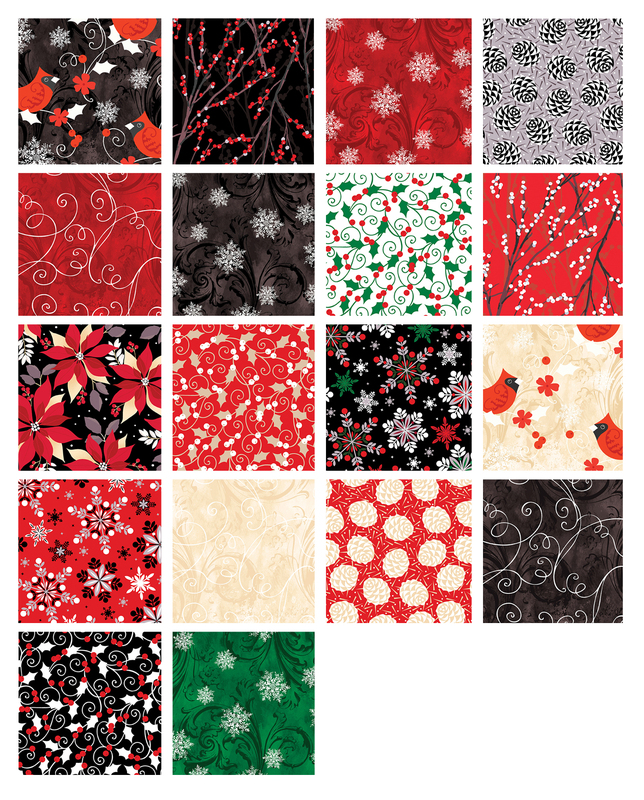 The fabrics are available in stores now, so you can get started on your favorite reindeer, snowflake, or Christmas tree quilt pattern now and be done before the holiday rush begins! Crank up the air conditioning, pull out your wool hat, and enjoy our Christmas in July series! Winter Story from Kanvas Studio tells the story of winter: cardinals, snowflakes, pinecones, and berry covered branches. The line has a touch of holiday cheer (holly), but is perfect for displaying all winter long. The fabrics have a contemporary feel, with graphic motifs, and a cool red, black and gray (or red and beige) color palette. 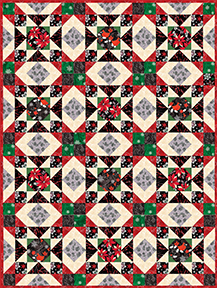 Download our free quilt pattern featuring Winter Story, "Winter Cardinals." Click here to see the entire Winter Story collection. I do love this collection! Those sweet cardinals really pulled me in. The black accents are perfect! The red and black make for a great Christmas collection. Wonderful fabrics and the touch of black is really nice! Barb, if you visit our website, there's a store locator button. A number of shops come up if you type in Sun Valley. It's also available on Fabric.com, although they don't appear to do FQ bundles. How I've longed to make a black/white/red quilt and runners for my home. I love the Winter Berries and Pine Cones. Thank you ! Oh I think this is such a pretty Christmas fabric line! Love it. Feeling the red, white and blue!